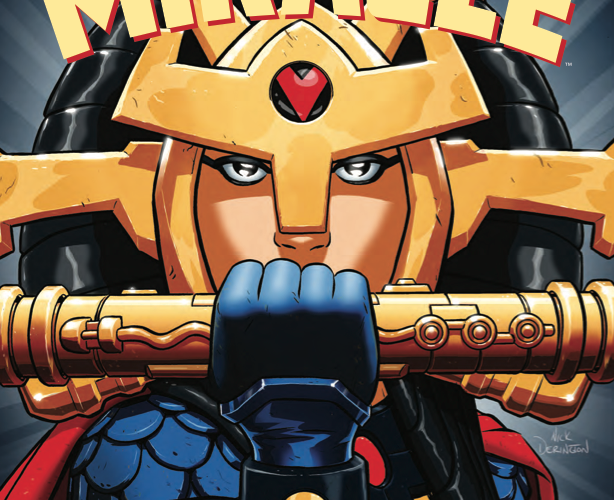 Mister Miracle #4 Review – AiPT! Mister Miracle: a story about what appears to be an average guy who is actually a god who lived under Darkseid’s totalitarian rule of Apokolips; that’s gotta be a heavy weight to bear and the first few issues have shown the burden is clearly affecting him. This issue deals with a somewhat battered Scott Free and the judgement of Orion, the very person who he was switched with as a child to enact peace between Apokolips and New Genesis. It’s the trial of Mister Miracle! Orion and Lightray are convinced that Scott has become infected with Anti-Life and is working against them to bring down New Genesis. Scott must succumb to their interrogation and physical challenges to prove he’s not what they say he is…but how do you speak truth to people who don’t want to believe? Tom King and Mitch Gerads make good comics. Sheriff of Babylon is beautiful, thought provoking, and timeless. They’ve brought their talents to Mister Miracle and have blended thought-provoking stories and superheroes very well. It is also a comic that’ll make you come up with theories as things don’t always make sense. Do they sell Green Lantern shirts in the DCU? The events of this issue roughly take place over twenty four hours and four scenes. It opens with Mister Miracle bruised in bed as Barda takes care of him. Lightray shows up to ruin his rest as a trial must commence via Orion. Great. As the story progresses we see Mister Miracle AKA Scott Free moonwalking through his life. He’s clearly in pain physically and mentally, dealing with depression or maybe PTSD. When the trial commences he suits up though it all takes place in his living room. With a veggie tray witness, Orion lays down his trail as judge, defender, and accuser. Seems fair. Much of this issue is focused on this one scene save for a delightful page of Mister Miracle escaping which you can see below. This trial utilizes the dialogue like kitchen shears, cutting and moving about with a hacking, but sometimes precise sort of way. There’s repetition used very well and a great sense of emotion conveyed as the story progresses via the beautiful 9 page layouts. If you’ve ever been in a conversation and felt your head get hot and angry you’ll relate to the interchange between Orion and Mister Miracle. As Orion seeks to find the truth you get the sense that it’s an unfair way of going about it seeing as Mister Miracle can’t really trust himself or his emotions. Mister Miracle isn’t really in control of himself and from beginning to end it’s quite clear the man needs to rest and contemplate for quite awhile. The art in this issue is fantastic. The 9 panel layout is not an easy one to do well and the repetition of backgrounds helps solidify the smallest of movements and facial expressions. There’s a dance going on here and Gerads does an exactly job tiptoeing, jolting, and prodding the reader with the character’s every movement. The strange television askew effect continues to be used and it continues to be at once jarring and strange. I suspect we’ll all be reading this again once we’re enlightened with King and Gerads’ deeper purpose and meaning, but it still conveys a sense of otherworldly oddness that suits these characters. Then there’s the excellent page below, which serves as a transitional page between heavier moments. It’s so simple, but so very good at telling the story visually. Less can, when done right, do a lot more. Aside from a bubbling of emotions by the issue’s end I can’t put my finger on what is happening to these characters or where it’s going. It’s a failing of the single issue format as I suspect King’s story will make much more sense when read in a trade paperback. That makes this read feel uneasy and somewhat unfinished. If this were a television show for instance, this single issue would serve as a 20 minute portion of an hour long and not the full episode with a beginning, middle and end. Mister Miracle is thought provoking in its steady pace and story. We’re witnessing a tale that draws you in like no other comic as we attempt to understand its characters and, maybe a little, better understand ourselves. A strong issue as it shows the bubbling of emotions very well.